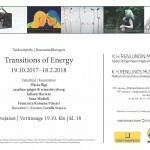 “Transitions of Energy” presents five international artists which investigate how energy and light interact with the stream of life in different fields. The two kinds of forces can take several dimensions and deal with different issues. Exhibition curated by Lorella Scacco. Flavia Bigi focuses on the research of inner spirituality. Casaluce /geiger :::synusi@cyborg analyses posthuman territory and cyborg stream of life between real and virtual dimension. Juliana Herrero tackles the subject of energy by dealing with sound recordings and digital found footage materials of multimedia descent. Sissa Micheli explores kinetic energy in relation to its spatial and temporal dimensions through artificially animated structures. Francesca Romana Pinzari works with physical interaction between people.